UPDATED Feb. 13, 2017 (see comments below). I’ve been out of the country since August 2016, so I was not able, until now, to examine the 50% Design Development (DD) drawings for the proposed Fine Arts Library that have been made available for viewing in the Dean’s office. This post, therefore, may well be old news. However, having already noted numerous problems with the schematic design proposal, I was curious to see if any or all of them had been resolved. As far as I can tell, the proposal still has many problems, some old and some new. In particular, it appears that the fire wall shown in the schematic plans has been eliminated (replaced with various “fire barriers”) so that the advantages of considering Rand Hall as a separate building (only possible with a fire wall) have apparently been discarded. I’ve sent out an email today with a bunch of questions for the contact person at Cornell Facilities, reprinted below, and will update this post if I get any answers. 1. The Building Department Notes in the 50% DD set list the 2010 NYS Building Code and 2010 NYS Existing Building Code as governing Code documents. Will the drawings be changed to reflect the 2015 NYS Building Code and 2015 NYS Existing Building Code now in effect? 2. There is no comprehensive Code analysis in the 50% DD set that explains the basis of the design. For example, the schematic design proposed a fire wall between Milstein Hall and Rand Hall, allowing Rand Hall to be considered as a separate building. There is no fire wall shown in the 50% DD set (except for “mobile fire wall” notations on one of the elevations — see Question #6 below); therefore Rand-Milstein-Sibley Hall must be considered as a single building with a single construction type. This construction type is V-B, based on the 3rd-floor wooden wall construction of Sibley Hall, and not II-B as noted in the DD set. A Code variance granted in November, 2013 acknowledges the fact that the existing library as designed and constructed on the third floor of Rand Hall (or a proposed, but not yet designed, library on the second and third floors of Rand Hall) would be noncompliant under the 2010 NYS Building Code, and requests that two specific 2010 Code sections be waived. As a result of the variance hearing, certain requirements in Sections 503.1 and 504.2 of the 2010 NYS Building Code were waived, allowing an increase in the allowable floor area of the second floor from about 22,500 square feet to 70,000 square feet and permitting the library to exceed the second-story limit stipulated in the Code (based on its V-B construction type and A-3 occupancy class) and to occupy the third floor of the “Rand Hall” portion of the combined building. A third Code section waiver, not originally requested by Cornell but suggested by the Hearing Board, waives portions of Section 715.1 of the 2010 NYS Building Code so that the requirement for opening protectives (for the windows that penetrate the fire barriers between Milstein, Rand, and Sibley Halls) no longer needs to be applied in considering the Code compliance of the existing library. This variance clearly allows the current third-floor library to remain in Rand Hall. It does not, however, change the construction type of the combined buildings from V-B to II-B. It should be emphasized that without a fire wall, Rand Hall is not a separate building, even with the variance, and its construction type remains V-B. On what basis is the construction type for this project listed as II-B? 3. A Code variance specifies what can be constructed, not merely by enumerating practices that are deemed allowable for a particular project, but rather by waiving specific Code sections that would otherwise render the construction noncompliant. The Code variance granted Cornell in November 2013 waives three Code sections in the 2010 NYS Building Code, allowing the current third-floor library to remain. However, those Code sections are no longer applicable to new construction or renovation, since a new 2015 Building Code has taken effect. The variance granted in 2013 for the current library did not waive any Code sections in the 2015 NYS Building Code. Do you believe that a new library built under the 2015 NYS Building Code (and 2015 NYS Existing Building Code) can waive floor area, story height limits, and window protective requirements in the new Code on the basis of a waiver of three Code sections that were granted with respect to the existing library under the 2010 Building Code? 4. Since the building construction type of V-B is neither Type I or Type II, the maximum aggregate area of a mezzanine is 1/3 of the floor area of the room in which it is located. On the basis of what Sections in the 2015 NYS Building Code can the mezzanines shown in the 50% DD set exceed this 1/3 floor area limit? 5. Section 712.1.9 (Two-story openings) of the 2015 New York State Building Code requires that all floor openings must be “separated from floor openings and air transfer openings serving other floors by construction conforming to required shaft enclosures.” Mezzanines, while not counted as “stories,” are still counted as “floors”; therefore openings connecting any more than two such floors are not permitted unless protected by a shaft enclosure, or designed as atriums. How are floor openings connecting all four floors (not stories) in the Fine Arts Library permitted under the 2015 Building Code? 6. There are two notations on the West Elevation in the 50% DD set that say something like “mobile fire wall” (the font is so small that, even with my reading glasses on, I can’t make out the exact words) and point to the north-west and south-west corners of Rand Hall. What do these notations mean? What is a “mobile fire wall”? 7. A sectional drawing in the 50% DD set shows a dimension of 2’-3” below the hanging 2nd-floor stack area, but seems to show protruding objects on the south side of this hanging floor that are higher than 2’-3” and therefore in violation of the 2015 NYS Building Code and ADA. 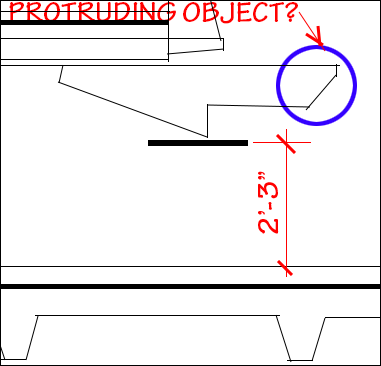 Can you explain what these protruding objects are (see sketch below) and why you believe that they are Code-compliant? UPDATE Feb. 13, 2017: I received a brief email response from the Project Manager/Sr. Engineer at Cornell Facilities: “Thanks very much for your thoughts and input and I will forward your email to our design team. It appears that you are reviewing a 50% DD set, which has evolved considerably. Once the DD phase is complete there will be new drawings that may address many of your questions.” In other words, it looks like I won’t have any definitive answers to these questions until the 100% Design Development drawings are released. Links to all my writings and posts concerning the Fine Arts Library proposal can be found here. This entry was posted in Architecture, Milstein-Rand-Sibley Hall on February 9, 2017 by jonochshorn.